Maybe you like a challenge, maybe you forgot to order seeds. Whatever the reason, you find yourself wanting to grow something but lacking in little paper envelopes. But don’t despair, just raid your pantry for some gardening goodness! You can grow garden vegetables right from the ones in the grocery store. I have never bought seed garlic, yet I’ve been growing enough garlic for our family for several years now. At first it was just regular old garlic from the store, but now I’m planting garlic that I originally saved from a CSA basket. It is a hardneck variety, so it’s fun to get the scapes AND the cloves. No seriously, it’s so easy, even I have yet to mess it up. And that means it’s REALLY easy. I am the person who killed blackberries. Just saying. And you can plant garlic in the fall, which is awesome, because it spreads the garden joy out a little further into the year. Okay, ready to hear how to do it? Drumroll please…. Break the head up into individual cloves and then you put them in the ground pointy side up, about six inches apart. Dig it up in the spring. I told you garlic was awesome. If you really wanted to make it harder, you certainly are welcome to do that. I’ve even included some links below for all you over achievers to look through. I’m just happy it’s alive. Now, I will admit I mulch and add compost to all my garden beds, and I usually will loosen up the soil before planting. But I’ve skipped that part before and it hasn’t died. So yay! Easy is good! I took a gardening class once. The teacher talked about growing tons of the soft neck variety and then braiding several together and selling them. She said it was one of those things that people just ate up (hehe) at the farmers market. So, if you grow too much, you know what to do with it. I love growing garlic. Even though they say that you can’t be sure if the garlic you get at the grocery store will grow, I did grow garlic a few times from garlic I got from the store. 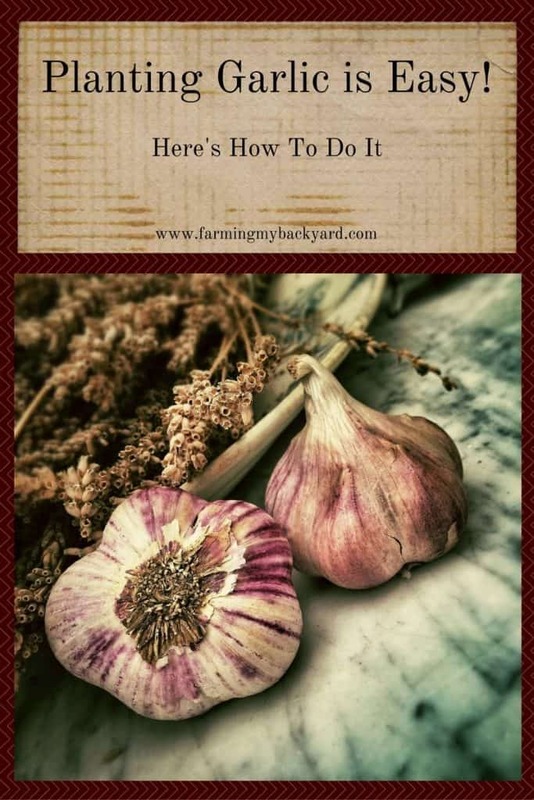 But the great thing about garlic is that even if you invest a bit of money in buying good garlic seed, you’ll probably only have to do this once since you can save some of your garlic for seed for the next year. The only downside with garlic is that it’s tops don’t shade the ground so there is always weeds to pull unless you use mulch. Will garlic grow if the winter temp drops down to -30 degrees? I live in Alaska and would like to grow more things our growing season is short for the back yard Gardner. Garlic can be grown in Alaska if you plant the right varieties and put it in before the ground freezes hard. Here are some links specifically about growing garlic in Alaska, including lists of good varieties. You are so right about planting garlic. It’s almost embarrassing it’s so simple and you condensed it to a few short sentences. I find the hardest part of growing garlic is cleaning it up and waiting for it to cure in the barn. Here is a series of videos I did about planting, cleaning, and harvesting. We are just getting started with chickens so your chicken tips section will be of great help. Thanks! You must have your hands full with all the critters! Nice job. It’s true, my kids tend to run off with the garlic while it’s curing, so that’s the hardest part for me too! You can’t really go wrong with any sorts. I’ve had good luck just planting garlic I’ve gotten from the store or our CSA. If you’re purchasing garlic it really depends on how strong you want the flavor, and how long you’re planning to store it. Seeds catalogs should have those kinds of details in their product descriptions.